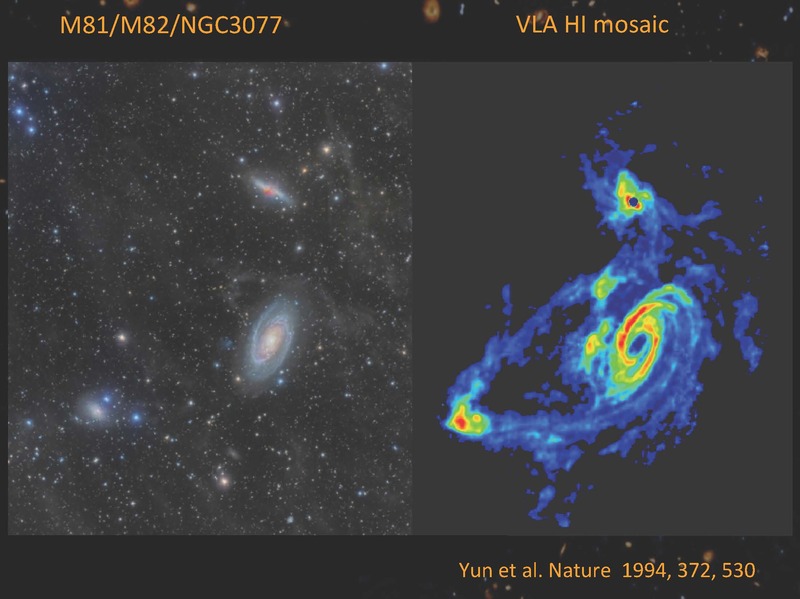 Scientists now know that 10 billion years ago, star formation activity in galaxies started to decline dramatically to reach its present level. However the amount of gas like hydrogen (the fuel of stars) available in galaxies does not appear to have undergone a similar drop, so that the origin of this dramatic decrease remains a puzzle. 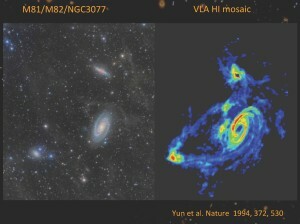 In the last decade the picture of how galaxies form and evolve has been largely influenced by large surveys of the sky conducted by telescopes at optical and infrared wavelengths, measuring the stellar light and radiation from dust and molecules in galaxies out to vast distances in the universe and by cosmological simulations attempting to explain the observed characteristics of these galaxies. But neutral hydrogen gas, which is only ‘visible’ at radio wavelengths in and around faraway galaxies, is essential to complete the picture. Until now, detailed observations of neutral hydrogen in and around galaxies have been restricted to very local objects and span only the last billion years (The Universe is 13.7 billion years old) due to current radio telescopes’ limitations. To probe the neutral hydrogen to much larger distances, i.e. farther back in time to the last 10 billion years, and to confront the current theoretical predictions with observations, scientists at the conference showed they need the SKA. Estimates presented at the SKA science conference showed the first phase of construction of the SKA (roughly 10% of the full array) will allow astronomers to probe the gas in and around galaxies up to 5 billion years ago, while the full SKA will enable to peer back to the crucial time 10 billion years ago when the rate of star formation suddenly dropped. Having access to neutral hydrogen in galaxies with the SKA, optical and infrared radiation from stars and dust from optical surveys, and molecular gas observed at sub-millimetre wavelengths thanks to ALMA, astronomers hope to be able to finally understand the processes behind galaxy evolution. Neutral hydrogen (right) and visible light (left) image of the galaxies Messier 81, Messier 82 and NGC3077, the main members of the Messier 81 group of galaxies. The neutral hydrogen not only traces the interstellar medium in the galaxies, but also the dramatic results of gravitational interaction between the galaxies and the resulting gas flows. Only a radio telescope can trace these and SKA will be able to get equivalent images for galaxies as they were more than 5 billion years ago, so scientists can chart the whereabouts of gas in and around galaxies over cosmic time to pin down the role of gas in galaxy evolution and test the theoretical predictions. Not only will the sensitivity and resolving power of the SKA allow astronomers to measure the amounts of neutral hydrogen in galaxies, but it will also allow them to image the detailed distribution and motions of the gas in order to diagnose the importance of gas inflows and outflows. It will also probe the dark matter content of galaxies, the prime cosmological matter around which the galaxies of gas and stars that we can observe formed and evolved. The SKA’s sensitivity also has the promise of finding the very faint gas flows into the galaxies from the so-called cosmic web, the filaments and sheets of material that interconnect all galaxies in the universe.